The pancreas is a fish-shaped organ that stretches across the back of the abdomen, behind the stomach. 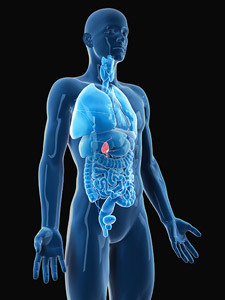 It is both an endocrine gland producing several important hormones, including insulin, glucagon, and somatostatin, as well as an exocrine gland, secreting pancreatic juice containing digestive enzymes that pass to the small intestine. The gallbladder is a structure on the underside of the liver on the right side of the abdomen. The function of the gallbladder is to store bile that is produced in the liver before the bile is secreted into the intestines. Bile secreted into the intestines helps the body digest fat.